This is not an out-of-focus picture! I recently was offered the chance to try out one of the new tattoo removal creams, Trufade, and I jumped at the opportunity. Despite my initial belief that tattoos should be forever, I’ve long considered laser removal for this one tattoo only. However, the cost has kept me from booking a set of appointments–the tattoo isn’t hurting anything, so it has stayed. I’ve also heard that laser removal is more painful than the actual process of tattooing, and although I have no problem with weathering some pain, that also has helped to put removing this tattoo on the back burner. But the idea of a cream that I could do at home piqued my interest. As a tattoo historian, I’m well-familiar with some of the historical tattoo-removal potions, like the ancient Roman recipes found in the writings of Aetius. So I’m intrigued by the concept of a modern formula that will disperse the pigment. Tracking the history of one tattoo on your body is a fascinating visual project. 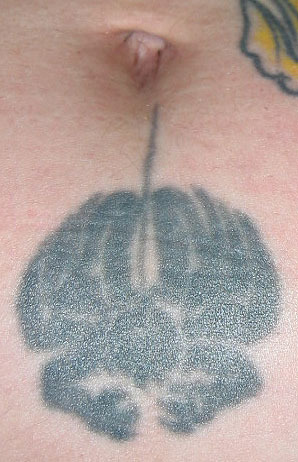 I only have one other picture of this tattoo taken in 2006 when I first taught my social-science survey of tattoo culture at the School of the Art Institute of Chicago. I thought a better way to introduce my students to my own tattoo history would be through a picture slideshow of all my ink, rather than a classroom striptease! Little did I know those pictures would serve as a useful documentation of how my tattoos have aged over time. 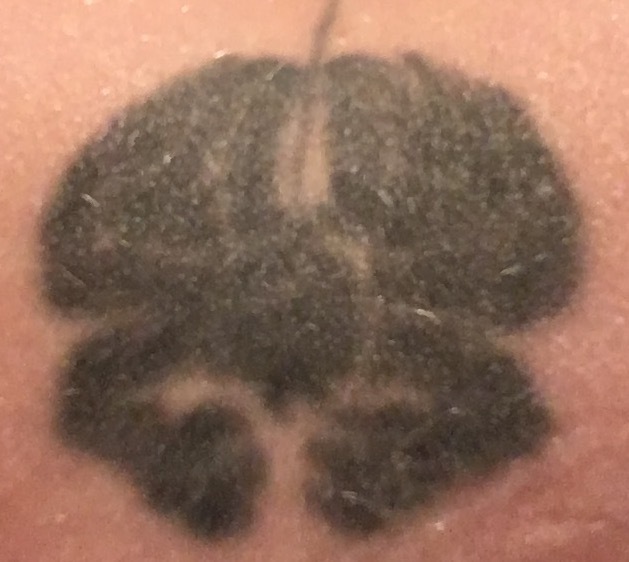 Even a decade ago, this tattoo had gone quite blurry. So what *was* the inspiration for this tattoo? In 1990, having just graduated high school, I was working in a new-age bookstore in Salem, MA, near where I grew up. 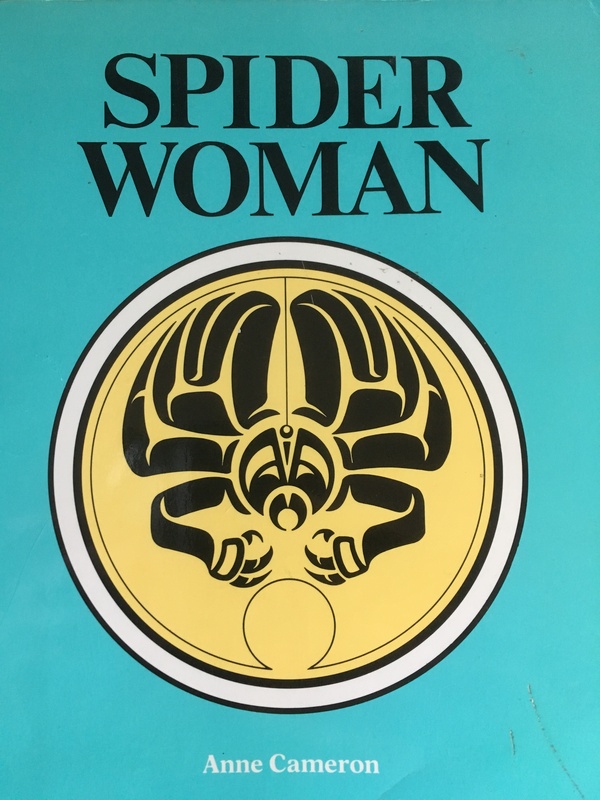 I got a discount on books, and one of the interesting ones that I picked up was a children’s book about a Northwest Coast spider-woman legend with some lovely illustrations and a book cover in my favorite color. It just popped into my head that the cover image would make a nice tattoo–a spider dangling from my bellybutton. During summer break from college the next year, my friends and I went to get more tattoos. And so I got this, and also got the band logo for Einstürzende Neubauten elsewhere on my body (these two tattoos might tell you a lot about me at the time!). It did look great when it was first rendered. Believe it or not, all the negative space in the original image was present in the original tattoo (you can kind of see the empty space still in the back of the hand on the right). Beyond how terribly this tattoo has aged there’s another reason I’d like to remove it: it ventures into cultural appropriation. Some of my other tattoos reflect cultures whose heritage is not part of my blood, but in those cases I feel I can make an argument for a legitimate connection (for example, travel or deep research). With this one, I just can’t justify it. It was a cool image I saw on a book cover. I have no connection to Northwest Coast indigenous culture other than owning this book. I’m not going to fault my 19-year-old artsy self for making the decision to get this design tattooed, but my 45-year-old, PhD-cultural-studies-steeped self knows better than to be wearing this image on my body. I’m happy to have the chance to make this right by removing it.